Italy's manufacturing sector contracted for the sixth successive month in August, although it did so at a slightly slower pace than had been the case in the previous two months. However the outlook for Q3 GDP does not look any too promising, given the back-to-back contraction we have seen in July and August. The Markit Economics Purchasing Managers Index rose to 47.1 from July's 45.3, remaining clearly below the 50 divide between growth and contraction. August data revealed falls in new orders, output and employment as manufacturers struggled in the face of a weak domestic economy," the Markit/Adaci report said. Economy Minister Giulio Tremonti has already said growth will be "around zero" this year, below the official government target of 0.5 percent, but pretty realistic as far as can be seen at this point. It all depends on Q4 , since the downside risk is that Q4 gives a bad result which puts whole year 2008 into negative territory. The PMI survey showed that while the rate of decline in new orders, output and employment was slower than in recent months, the quantity of purchases fell at the fastest rate since November 2001, shortly after the attacks on the U.S. World Trade Center. Input price inflation eased to its slowest rate since May and output prices showed the slowest rate of increase since December last year. Unlike Consumer Confidence which rose slightly in August, Italian business confidence held stubbornly at its lowest level since the Sept. 11 terrorist attacks as the risk of recession and slumping consumer demand kept a tight grip on optimism among Italian manufacturers. The Isae Institute's business confidence index held at 83.5, matching last month which was the lowest reading since October 2001. And while some components rose slightly in August, others fell, including the all important the production outlook, which continued its decline, falling to 1 in August after slipping to 5 in the previous month. 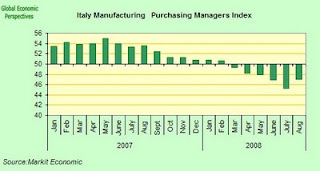 Which means, the PMI for September may very well offer us even more contraction. While it's true that an aging population generally consumes less (except for health care, etc), everything is indeed relative. Across different societies, consumption patterns and levels of "a certain age" are quite variable and reflect their national society. 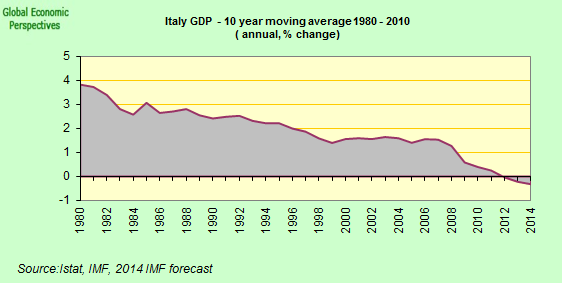 A lot of money that would normally be used to stimulate the national economy in Italy has nothing to do with age. It is a purely economical decision. Money that Italians have accumulated in offshore accounts in Switzerland and other offshore centers for the past 40 years or so is being spent outside of the country. For example, much of the investments being made here in Miami by Italians are being made by Italians who transfer their cash here via Swiss Bank Accounts. This is quite ironic, because since these invested funds via offshore may in fact be both unreported and have not been necessarily lawfully subjected to Italy's fiscal regime. They are clearly at a huge risk if they were to launder their money within Italy. 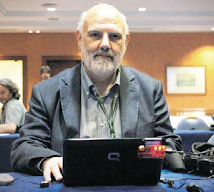 Any attempt by the Italian government at implementing a tax amnesty has a huge risk of being ignored, as any type of repatriation funding would automatically flag those individuals for future auditing. It's a lot easier to continue just to hide the money outside of Italy and find other ways to launder your money - witness the increasing Italian investment phenomenon in South Florida. Italy is evidently not the only interesting country in the world for investing. An Italian here told me to look at the "bright side", at least he is now trying to make money legitimately - but would not even have had the chance to do so had he been required to pay his legally owed sums to the Italian Public Treasury. He did say that he is paying his full extent of his US taxes, so the US tax authorities need not worry about receiving their share of the Italian pie of laundered funds. Meanwhile, an ever decreasing Italian middle-class has to bear the burden to support middle class Italian services as an aging middle-class population in Italy has not the capital to move it so freely across borders like the new age globalization-influenced rich people of the world get to do. Not really economics, I know, but it's 1) an example of human character - though not exclusive to Italy, and 2) a proof that globalization ensures that the new "trickle down" theory of economics is indeed working, as long as the entire world is the rich person's playground. Good luck, though, getting a jet setter to trickle the majority of it down into his/her own country anymore. And I seriously doubt the Italian middle class is in any position to offset the Italian wealthy people's gains - thus the gap between the two will widen even more, although stats will be thin due to the offshore nature. Finally, the Italian wealthy have the control of capital, and so they can play the global game and expand their investment choices. The Italian middle class is unable to therefore take full advantage of globalization - and will be in fact losing victims of it. This is just one aspect of the impacts of globalized capitalism. Technology and innovation can to a certain extent offset this pattern, but even then, does not Italy have a relatively mediocre entrepreneurial environment to encourage technological breakthrough? Don't those handcuffs feel good?